So begins the narration on the visitor center film at Speyside Cooperage. I found myself sitting in a small theater surrounded by other tourists, including a group of middle aged men from the Netherlands who had arrived on motorcycles. The film painted a picture of coopers as the caretakers of an ancient craft practiced by Celtic demigods. Muscular men appeared out of the mist wielding their traditional tools as fire blazed in the background. While the reality may not be quite as epic, Speyside’s coopers undoubtedly play an indispensable, if underrated, role in the Scotch whisky industry. Scotland’s Speyside region is famous for distilling high quality single malts like Glenlivet. But distillation is only one part of the process when it comes to creating aged spirits such as whisky, brandy, and rum. The next, and some might argue, more important, part happens in a wood cask, where a distillate is allowed to rest, maturing in flavor, deepening in color, and developing a generally more complex character over time. A single distillery can have dozens of warehouses filled with hundreds of thousands of casks. 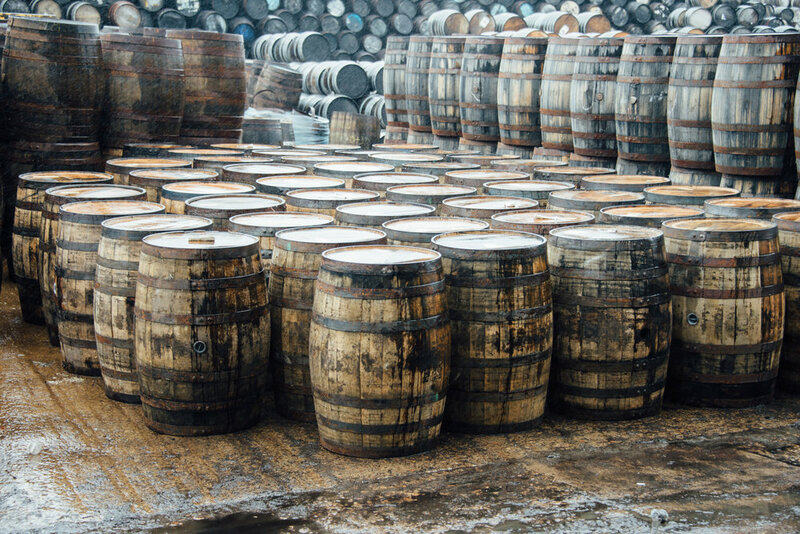 Each of these casks has been handcrafted by a skilled cooper. In a rural community with relatively few job prospects, coopering is a physically demanding yet highly rewarding job. Coopers are paid by the cask, with masters finishing between 25 and 35 in an eight-hour shift – or over 6,500 per year. Newly made casks are delivered to distilleries throughout Scotland where they are used to age new whisky distillate. The Speyside Cooperage, which has been crafting casks since the end of World War II, is on the outskirts of the Scottish village Craigellachie. In the decades since its founding, the business has strategically expanded to an additional location in Kentucky, America’s bourbon country. The heart of Speyside Cooperage’s business, however, remains in Scotland. Speyside features a pastoral landscape of rolling emerald hills and lush river valleys that is tamer than the wild, rugged Highlands to the west. Craigellachie itself is a small village with an outsized importance in the Scotch whisky production. In addition to the cooperage, the village boasts one of the highest concentrations of whisky distilleries in Scotland. There are more than a dozen within a five mile radius, including the Macallan Estate and distillery and the John Dewar & Sons distillery. Following the introductory film, our guide led us on a tour of the factory floor. He had been a cooper for over 20 years, and his knowledge was on display as he showed us around the production area. The cooperage is a modern factory filled with machinery used for various parts of the manufacturing process. Cask assembly and repair, however, are done by hand using tools and techniques that coopers have employed for centuries. The stows, or pyramidal mountains of casks in the cooperage yard, are a testament to their prodigious output; Speyside coopers assemble and repair over a hundred thousand casks every year. Demand continues to outpace supply given the worldwide growth in craft distilling and whiskey consumption in recent years. Reusing old casks helps fill this demand. Casks can remain in production for as long as 60 or 70 years, but a lifespan half that age is more common. During its lifetime, a cask can be refilled multiple times and used to age a variety of spirits. While Scotch whiskey can be aged in either new or used oak casks, many are aged in used American bourbon barrels. There is a surplus of ex-bourbon casks, since by United States law, bourbon can only be aged in new American oak casks. The Speyside Cooperage in Kentucky acquires many of these once-used barrels, disassembles them to save space, and ships them to Craigellachie where they are inspected for damage and rebuilt for ageing Scotch. The tour guide estimated that around thirteen million used casks are currently in circulation among Scotch distilleries. As a spirit ages, two things happen: the spirit soaks into the wood, and the wood transfers its desirable compounds into the spirit. These changes impact the character of the cask and the flavor profile of both the current spirit and future spirits aged in it. It is possible to prolong a cask’s life by removing the existing char and re-charring the interior, which introduces new wood to a spirit; however it is the master distiller’s responsibility to determine when a cask is no longer able to impart a desired character into the spirit, and thus retire the cask. Building a cask from scratch is the true test of the cooper’s skill, and a properly built cask can hold a spirit for years without leaking. To appreciate the skill involved, it is important to understand how a cask is made. The process of building a cask begins with stave selection, one of a cooper’s most critical tasks. Stave blanks come to the cooperage from stave mills. Staves in new whisky barrels are made from American oak, which is more dense than European oak varieties. This means that less of the spirit will evaporate over time – what’s known as the “angel’s share.” Staves are shaped in such a way that they both form the curved circumference of the cask and can also be bent together so that a cask’s middle girth is wider than its ends. Initial assembly consists of placing one end of the staves inside a metal hoop while the opposite end is splayed out like the bristles of a broom. Selecting a properly sized hoop and stacking the saves within is one of the most skilled parts of a cooper’s trade. That point was underscored at the end of the tour. One of the Dutch motorcyclists was selected to attempt assembling a toy cask. He struggled to line the staves up within the hoop, all of which would inevitably collapse into a pile of pick-up sticks, much to his friends’ amusement. Admittedly, none of us could have done any better. After a cooper arranges the staves within the hoop, they are steamed for up to an hour to make the staves pliable. The splayed ends are drawn together using a windlass, which is essentially a winch attached to a lasso. The lasso holds the unbound ends in place while the winch works to draw the lasso tight, drawing the staves together. A second hoop is then fitted over the the staves to hold them in place, forming the other end of the cask. The hoops are pounded down toward the middle of the cask, one of the more physically demanding tasks undertaken by a cooper. Once the second hoop is in place, the tightly fitted cask walls have been completely formed. Staves are curved together in this way so that a completed cask standing on one end is wider in the middle than at either end. This allows the casks to be easily rolled and maneuvered by hand. During the tour, we watched an apprentice pound hoops. His skill was apparent in the confidence and ease with which he performed the work. “He’s at the end of his apprenticeship,” the tour guide commented. “In a year, he’ll be at the top of his game.” I heard the approval in his voice, an experienced elder assessing the abilities of a young buck. Like any manufacturing process, coopering has benefited from the technical improvements of industrialization and grown into a global industry. Power equipment is used to cut the wood, drive the hoops firmly onto the casks, and pressure-test the casks. Crafting the casks, however, is still done by hand using traditional tools. Coopers take justifiable pride in their status as master craftsmen, and well they should. Virtually all coopers at Speyside Cooperage are local men who have apprenticed under a journeyman for four years. While I was at the cooperage, five apprentices were in various stages of their training. At the completion of an apprenticeship, the men go through a rite of passage called “Apprentice Blackening” or “Trussing the Cooper.” The apprentices are captured by their fellows, stripped to their skivvies, and coated with a mucky mixture which may include flour, treacle, and other sticky substances. The men are covered in feathers before being stuffed into the last casks they finished as apprentices. The casks are rolled around the factory floor. When the dazed men emerge from the casks, they are given a dram of the cooperage’s proprietary whisky blend. This ceremony, which dates back to the fourteenth century, marks the cooper's transition from apprentice to journeyman. As with many industries surrounding Scotch production, coopering has a global footprint while maintaining deep local roots. In 2008, the multinational Tonnellerie Francois Freres Group (TFF) purchased the Speyside Cooperage. TFF has cooperages across Europe, the United States, China, South Africa, and Australia. Back in Speyside, coopers keep busy building casks for aging Scotch as they have for generations. The pride that local coopers take in this tradition was evident throughout the tour. The tour guide revealed his father had been a cooper, as had his brother. "Lots of family connections," he said, as we made our way through the cooperage. When we passed by a young man hard at work, the tour guide proudly said: "His grandad built my house." It became clear during the tour that in Craigellachie, the people and the place are intimately connected by the bonds of time. The cooper in the visitor center film transformed into a symbol representing those who have lived and worked in Speyside for generations, crafting whisky, uisge-beatha, the water of life.